A passenger plane travelling to Europe, crashes into the Himalayas. It turns out that Tintin's young Chinese friend Chang was on board the aircraft. Tintin in Tibet (1960) is a story of pure friendship, without any of the usual villains: a tale of Tintin's desperate search to find his friend. The unusual narrative, which is much more introverted than those of other books in the Tintin series, tells the story that faith and hope are able to conquer all obstacles, and that pre-conceived judgements of others – in this case in regard to the yeti – are the fruit of ignorance. Tintin in Tibet was first published in Tintin magazine in the autumn of 1959. Hergé presented his proposed front cover for the upcoming book, to Casterman. The principle behind the concept was simple: Tintin, Snowy, Captain Haddock and Sherpa Tharkey, examining the yeti's snowy footprints. Apart from the colourful characters and a red oval at the top of the cover, which contained the title of the story in black font, the whole composition was bathed in white, accentuating the majesty and purity of the surroundings. The proposal was so radical that it did not manage to get beyond prototype stage. In Casterman's opinion the illustration was too abstract for children and a risky bet commercially. Hergé, usually intransigent over such matters, agreed on this occasion to add some sky and mountains in the background. When trekking in the mountains, you only take the essentials – no extra baggage is allowed. 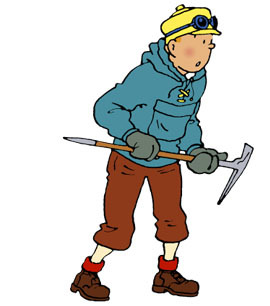 In Tintin in Tibet, Hergé chose his characters along the same principle. Tintin's extended family is reduced to its essentials: Captain Haddock, Chang and Snowy! It would be difficult to imagine Bianca Castafiore or Jolyon Wagg scaling the unforgiving slopes of the Himalayas. The arrival of the yeti in The Adventures of Tintin is the first time that the question of the boundaries between man and beast has been addressed by Hergé. He may not say much, but when he does, everyone listens. Blessed Lightning, a monk from Khor-Biyong, a Tibetan monastery hidden in the mountains, has visions when he levitates. His extra-sensory powers allow him to see things that are happening elsewhere, far from the sight of ordinary human beings. He becomes an unexpected ally for Tintin, helping to cement his belief that Chang is still alive. One of the amazing things about Tintin in Tibet: the heroes do not come across any villains as the adventure progresses. There is no-one to blame for any of the mishaps they encounter. The journey to Tibet is the reflection of an internal journey. Tintin's faithful friend Snowy may be a very good dog, but even he is not entirely blameless. Sometimes he has to choose between his duty and a good bone to gnaw on, and it is at times like these that his guardian angel and its devil alter-ego tussle for his attention. Most of the time it does not take long for Snowy to snap out of his indecisiveness, usually in the right direction. Throughout their careers as comic strip characters, Tintin and Captain Haddock dream and have nightmares. In this adventure Tintin has a premonitory dream, while Haddock experiences a troubling series of hallucinations, stimulated by a certain Scottish drink. The scenery in Haddock's dream is reminiscent of the paintings of the Italian surrealist painter Giorgio De Chirico (1888-1978). Tintin in Tibet ushers a new dimension into comic strips: the spiritual dimension. Although action and adventure play a big part in this story, the twentieth in the Tintin series, we can also see and feel other elements, emotions evoking the personal evolution of the author and the changing perspectives and values of his audience in the 1960s. As he matured, Hergé read works on philosophy, psychology and psychoanalysis. His readings lead him to discover and learn about Taoism, Zen and Buddhism. Mother nature and fate are the only adversaries in this epic adventure. It began magazine serialization just 8 years after China annexed an independent Tibet, so it's somewhat bittersweet that the helpless victim in the story is Chang - an ethnic Han Chinese. Still, the album is loved by Tibetans because it helped raise the region's profile and mystique. Tongue poking is indeed a legitimate custom in Tibet, apparently done upon greeting to show that one is not the reincarnation of a terrible Tibetan ruler from the past who had a black tongue. Though I wonder about the fan-shaped hand sign done in front of the nose (p53). The best of all Tintin’s Adventures and the humor depicted here by Hergé is excellent. Love the creator and it’s team of experts.